For those of you who follow my blog, you know that I can get a wee bit obsessive about the books I'm reading and the characters in said books. In The Matchmaker of Perigord by Julia Stuart, Guillaume has custody of a cassoulet his mother started many years ago. His mother is now senile, and since the cassoulet's origin was part of a feud, Guillaume is honor-bound to feed the cassoulet every day. This really grossed me out...I mean, there was an ancient bone that had been in there for years, and he even found a missing button in it. :/ I've been obsessing about this since December, and then I decided to get over my fear of cassoulets and make one myself. 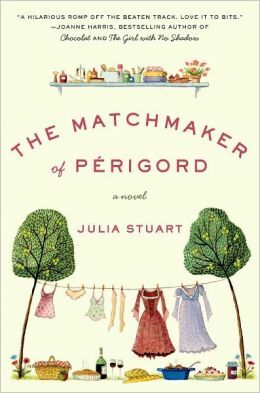 You can read my review of The Matchmaker of Perigord here. I decided to do some research on cassoulets, and this is what I found out about them. Usually they are cooked with a duck confit, white beans, and other vegetables with pork or (sometimes) chicken added. The pots used to cook then are deglazed and used in the next batch of cassoulet. But I also found out that it isn't unusual to have a really old cassoulet that has ingredients added to it. For example, I read that a hundred years earlier some restaurant had made a cassoulet in a (huge) pot and then gradually served it, added ingredients, recooked it, served some more, and ainsi de suite for the next hundred years. I've read the same thing about some sorts of meat stews in French restaurants, too. Cassoulet is traditional French peasant food, and the easy recipe below is delicious. Chop thyme leaves; slice garlic. Chop onion and carrots (2-inch pieces). Cut bacon into 1-inch pieces (wash hands). Preheat large stock pot on medium 1–2 minutes. Place oil and bacon in pan; cook and stir 2–3 minutes or until bacon starts to brown. Add garlic; cook and stir 1 minute. Season chicken with salt and pepper, then add to bacon; cook 2–3 minutes on each side or until browned. Add remaining ingredients (except croutons); bring to a boil. Reduce heat to low; simmer 1–1 1/2 hours or until chicken pulls apart easily with a fork. Top with crushed croutons; cook 7–8 minutes (without stirring) or until mixture thickens slightly. Serve. The most that I can do is read and imagine what is a cassoulet. Lucky you and your family because you know how to cook. Again, this is another chance that I always wish to be invited in your dining place haha Have a great week Ricki! Thank you for your kind words in my blog. I have never heard of this but it sounds dangerous! What kept people from getting really really sick? Your recipe sounds good though....I just wouldn't reheat and serve for decades. This looks great! I'm always looking for a new meal idea. Hi Ricki Jill~ I thought Matchmaker was a charming read and I was craving a bowl and easy recipe, sans button of course :) This recipe looks delicious and easy! We're getting a Publix next year and I can't wait, our local grocery store chain needs some competition! A cassoulet is very common here where I am from and most definitely a staple of French cooking. That looks like a good recipe for somebody trying it for the first time. Often a cassoulet will have duck, sausage and possibly pork. It becomes a bit of what you have on hand and as you say it can get better with time. Ricardo has a great cassoulet recipe which really represent the French Quebec cassoulet. I'm going to pin this right now! I love cassoulet and if this recipe works then I can't wait to try it!